Texas head coach Tom Herman was probably hoping to discover a thing or two about his team as it prepared to take on the No. 4 USC Trojans and Heisman trophy candidate Sam Darnold. At the end of the night, Herman walked off the field on the wrong side of the scoreboard. But he did discover one thing. He’s found his quarterback of the future—Sam Ehlinger. The freshman had a gritty performance in just his second start for the Longhorns. He did make some mistakes (two interceptions and two fumbles). But on a night where he had no help from his running game, he kept Texas in the game and had them in a position to pull off an epic upset. Ehlinger’s biggest mistake of the night came during the second overtime period when he fumbled the ball on the goal line. USC recovered which meant the Trojans could win the game with just a field goal during their possession. The Trojans played it safe on their possession and were more than happy to let their walk-on kicker, Chase McGrath, kick a 43-yard field goal to secure the win, 27-24. Texas would never have been in a position to win the game if it hadn’t been for Ehlinger. He converted twice on fourth down during a late fourth-quarter drive, once with a two-yard run and the other with an 11-yard pass to Armanti Foreman. Ehlinger capped off that drive with a 17-yard touchdown pass to Armanti Foreman with 45 seconds left to give Texas the lead, 17-14. But the defense couldn’t hold Darnold off in the waning seconds of the game, and he got the Trojans in position to kick a 31-yard field goal as time expired to send the game to overtime. Trojans fans expected their team to run all over a Longhorns defense that gave up 263 yards on the ground to Maryland. But the Texas defense came to play against the USC offense. 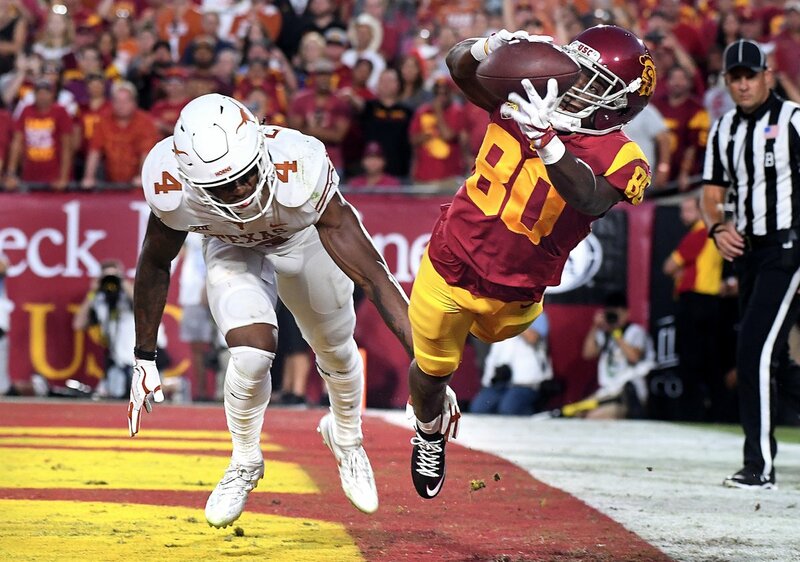 After running for more than 300 yards against Stanford, the Trojans ground game only mustered 71 against the Longhorns. Ronald Jones II gained only 47 yards on 18 carries. Stephen Carr managed just 28 yards on nine carries. Both ran for more than 100 yards each the week before against Stanford. In the end, Sam Darnold appeared to have a great day with almost 400 yards passing and three touchdowns. But he also threw two interceptions (including a pick-6 by DeShon Elliot in the second quarter) and needed 49 attempts to reach those lofty numbers. Texas had appeared to have its quarterback in Shane Buechele, but a shoulder injury opened the door for Ehlinger. With how Ehlinger has played, it is hard to imagine Herman sitting him down when Buechele is healthy enough to play. 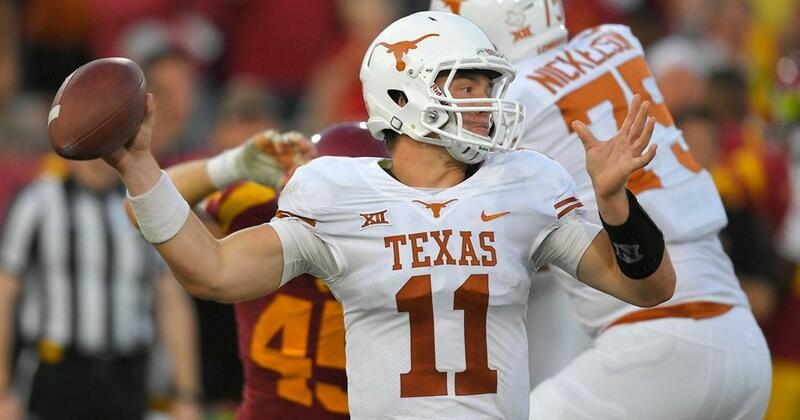 How ironic would it be if Buechele were to transfer to Texas A&M? The Aggies need a quarterback right now, but will likely need one next year as well. The Trojans will go on the road next week to face Cal (kickoff at 3:30 PM ET). Texas will have a week off before facing Iowa State on a Thursday night (9/28, kickoff at 8 PM ET).